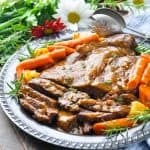 A classic comforting pot roast with vegetables and gravy plus there's an oven and slow cooker option. 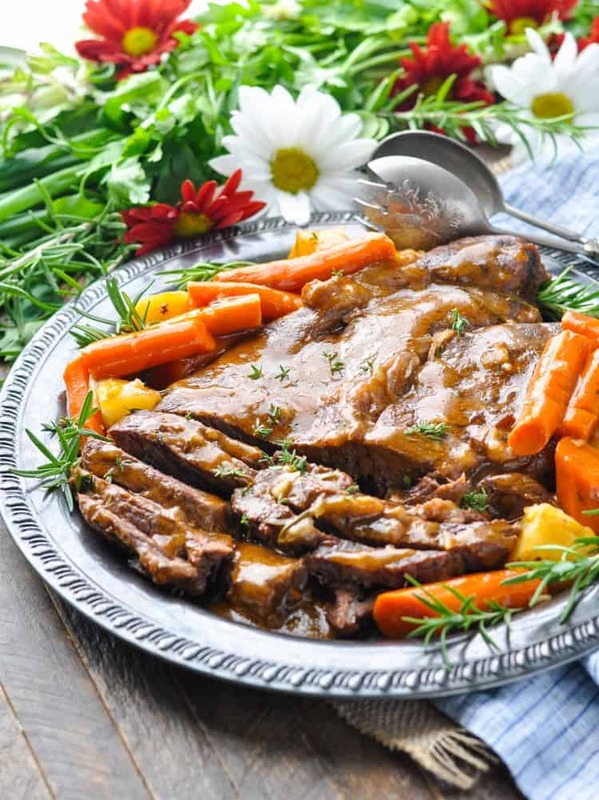 Nothing beats a cozy, tender Classic Pot Roast with Vegetables and Gravy on a cool evening! This simple slow cooker pot roast recipe is the easiest and most delicious way to prepare a beef roast — and it’s perfect in the oven, too! Whether or not you consider yourself a cook, I can assure you that it’s virtually impossible to mess up this Oven or Slow Cooker Pot Roast! There are no fancy chef skills or techniques required, and it comes out perfectly every time. I think of this dinner as the ideal Sunday supper. Just imagine: you’re sitting by the fire, watching football, warm under a blanket, and hanging out with friends or family for the afternoon. While you relax on the couch, take a nap, or play with your kids, the aroma of a rich, tender, and juicy pot roast wafts through the air. Your dinner basically cooks itself for a couple of hours while you enjoy some downtime! 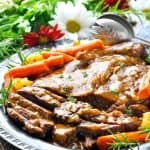 When your family is ready to come together around the table for a hearty meal at the end of the day, your slow cooker pot roast, veggies, and gravy will be waiting for you. Add a crusty loaf of bread or even more mashed potatoes on the side — something to soak up the juices — and you’ve got a nourishing and comforting dinner to share with loved ones. 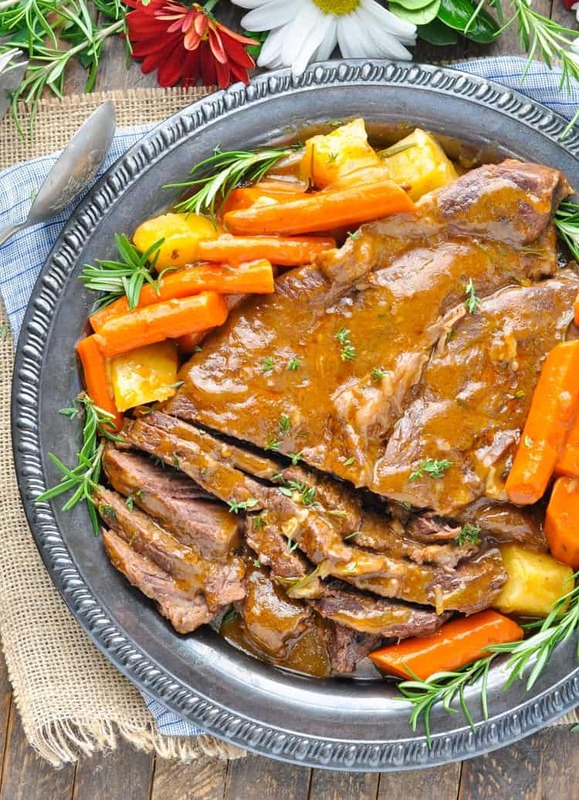 If you plan to be out of the house at work or running errands and you would rather use your Crock Pot to prepare the pot roast, that’s definitely an option! I’ve included instructions for the slow cooker pot roast below, too. And while I like to sear the roast in a pan for tons of added flavor before it goes in the oven (or Crock Pot), that step is not mandatory. If you prefer to just dump-and-bake the ingredients, that will work! Keep it simple and enjoy the easiest, coziest pot roast that you’ll ever taste! Heat olive oil in a large pot or Dutch oven over medium-high heat. Place meat in the pot and sear it for about 1 minute on each side, until browned all over. Meanwhile, in a separate bowl, whisk together condensed soup, dry onion soup mix, and water. Pour sauce over the meat. Add potatoes, carrots, onions, and herbs to the pot. Cover and bake in the oven for about 2 hours (for a 3-lb. roast). The roast is done when it’s fall-apart tender! Note: This pot roast can be prepared in the slow cooker, too! After searing the roast in a pot, transfer the roast to a large slow cooker. Pour sauce over meat, add vegetables and herbs, and cover. Cook on LOW for 6-8 hours or on HIGH for 3-4 hours. Cooking for a Smaller Family? Cook a small roast, and then freeze the leftover meat! It works well when it's reheated on Steak and Cheese Subs or French Dip Sandwiches! Note: The nutrition information is hard to calculate for this recipe, since it includes all of the gravy in the pot, plus all of the potatoes, carrots, and onions. In reality, you likely will not consume all of the extra ingredients in the pot, so nutritional information will vary greatly! My mouth is watering just looking at this deliciousness! 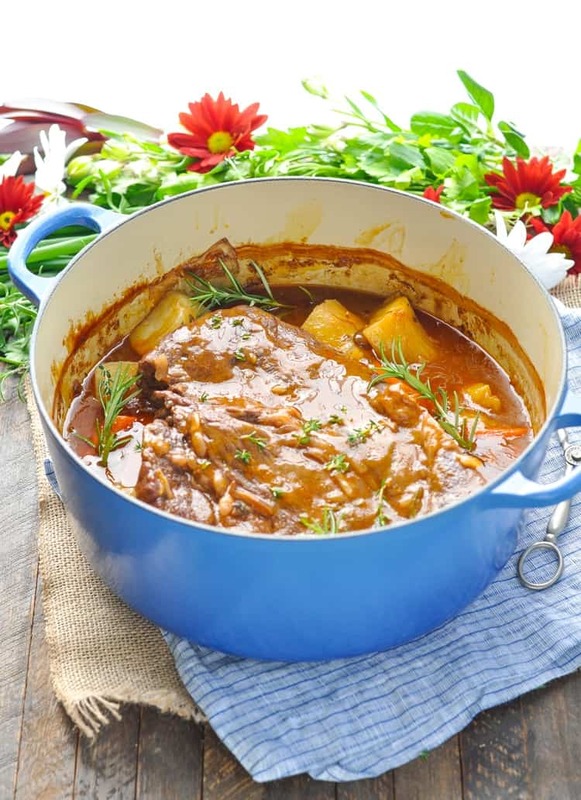 Pot roast is my absolute favorite comfort dish. It reminds me of my Grandma, she made such wonderful roasts! And you’re right, this recipe is fool proof! I love how easy it is. So perfect for a warm and comforting meal, especially in the winter! Thank you, Gayle! I love recipes that have such a strong memory associated with them. So glad that you love pot roast, too! It’s a classic, for sure! I am always eyeing off the chuck roasts – but I’ve never tried making one. This looks perfect so I think next time I’ll have to buy one! This looks so tasty and easy. I have tried several of your recipes and have never been disappointed. Love your week in review and keep the selfies. Your vests are all so bright and pretty. Thanks for your kind words, Jody! I appreciate your support! 🙂 Love those vests…Hah! 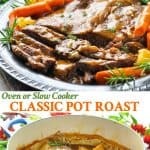 I love meals that cook themselves and pot roast is one of my favorites! Delicious! I have a small roast, only 1.70 lbs., how long should I cook it on low in a slow cooker? This looks fantastic. I have a bottom round roast, probably about 1.5 to 2 pounds. How long would I need to cook this in the oven for it to get fall apart tender? I have tried my roasts before in the oven and some have come out stringy and chewy, so would really like to know how to get a tender, fall apart melt in your mouth roast. Any helpful hints? Thanks! Hi, Brenda! I would bake the roast at 350 degrees F for about 25 minutes per pound. So if you’re using a 2-lb. roast, it should be well done after about 50 minutes. Enjoy! I have a 6.5 lb. 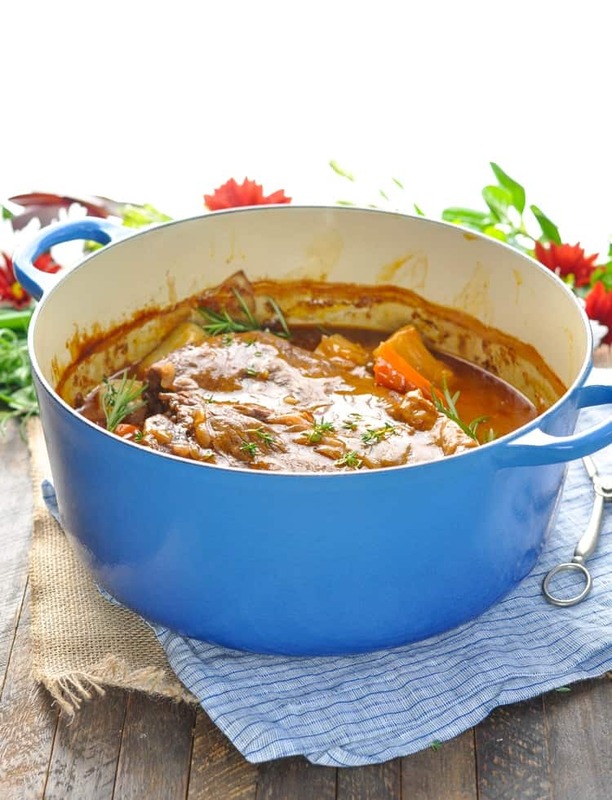 Chuck pot roast to coo and REALLY want to use your recipe. . Do I double the ingredients to place in with the roast. Double the water??? Please help. Hi, Dena! That’s no problem if you’re using a larger roast. I would double all of the ingredients and cook the roast at 300 degrees F for at least 4 or 5 hours. Hope that helps! Hi Loretta! I did not thyme or Rosemary as I had neither and it was still good. Tried it last evening. Delicious and foolproof, tender beyond my expectations. I’ll be using it again! Could I just put all the ingredients in a deep pan and wrap with foil? Hi, Rosario! Yes, that should work fine! This is almost the exact recipe I ate as a child. So many warm memories associated. I did not add the Rosemary or Thyme but it still came out delicious. I waited to add my carrots until the last 30 minutes or so. Everything came out perfect! Thank you for this comforting, family favorite. I’m so glad to hear that it lived up to your childhood memories! Thanks, Heidi! How long would I cook a 6.5 lb prime rib roast in the oven? And temperature? Hi! I’m going to make this for Easter dinner and was only able to find two separate smaller roasts -I wanted to total about ( lbs so one is 3.5 and the other is 1.5lbs. How long should I cook if they are separate pieces in the same pot. I was going to use a large roasting pan…and double your recipe. Thanks for the help! Hi, Charlene! The good news is that pot roast is pretty forgiving — the long cooking time just helps to break down the meat and make it really nice and tender, so it’s not something that you can easily “overcook” (like a more delicate steak or piece of fish). I would double the recipe and bake in the large roasting pan for 3-4 hours, checking it to see when it’s fall-apart tender. Enjoy!